Angus Whitehead (richard. whitehead@nie.edu.sg) is an assistant professor at the National Institute of Education, Nanyang Technological University, Singapore. His “‘A wise tale of the Mahometans’: Blake and Islam, 1819-26” is included in Blake and Conflict (Palgrave Macmillan, 2008), edited by Sarah Haggarty and Jon Mee. G. E. Bentley, Jr., has discovered some 2500 previously un-recorded reviews of books with Blake in the title published before 1992, and wonders what to do with them. Robert M. Ryan is emeritus professor of English at Rutgers University. He is the author of Keats: The Religious Sense and The Romantic Reformation: Religious Politics in English Literature, 1789-1824.
International Standard Serial Number: 0160-628x. 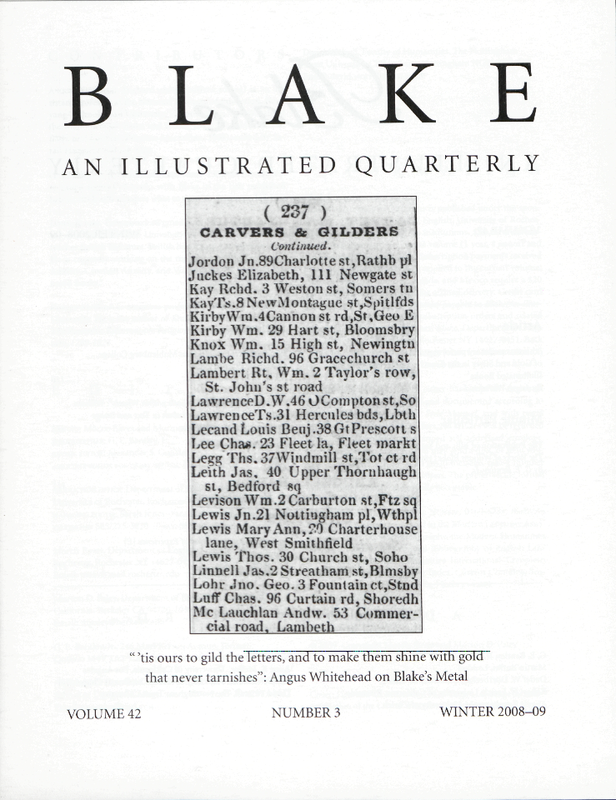 Blake/An Illustrated Quarterly is indexed in the Modern Language Association’s International Bibliography, the Modern Humanities Research Association’s Annual Bibliography of English Language and Literature, Humanities International Complete, Arts and Humanities Citation Index, Current Contents, Scopus, and the Bibliography of the History of Art. Cover: Pigot and Co.’s Directory, 1826-27, p. 114. Image by kind permission of the City of Westminster Archives Centre.